A good, cheap alternative, or maybe just cheap? 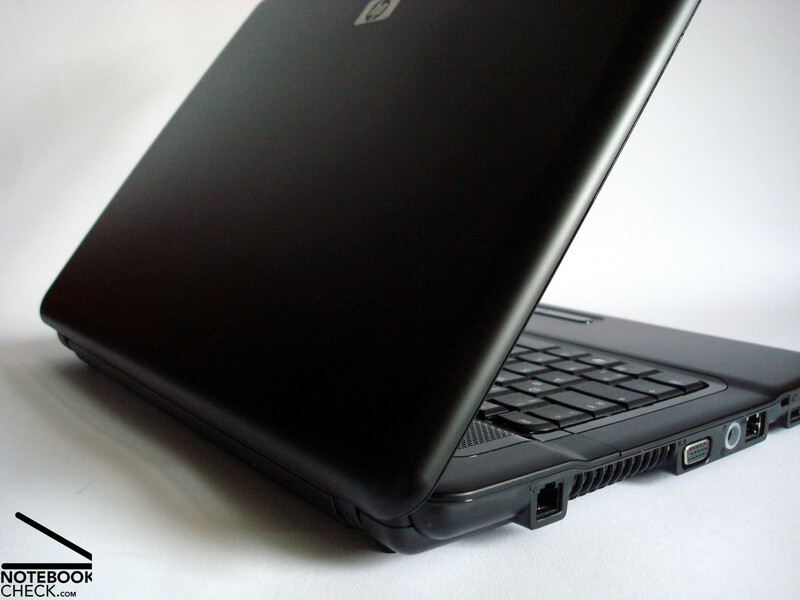 Eee PC & Co have proved many critics wrong with their current netbook boom. Apparently, these mini laptops, with their long battery life and modest performance, are not only selling well, they are also stealing potential buyers from other notebook sections. The low-end models of laptop producers have not remained immune to this drastic change. The producers are trying not to lose their hold in the market by aggressively reducing the price of their above-mentioned models. The HP Compaq 6735s belongs to this group, as it is not only cheap, but also has a good combination of ports. Our test model is available with many different AMD processors, such as: Sempron, Athlon 64 X2, Turion X2, and Turion X2 Ultra. The system of our test model is based on AMD's Puma-platform, which uses the integrated ATI HD3200 graphics chip. Unfortunately for the HP 6735s, the competition is high. It must fight against the netbook faction and the Intel dominance of the market for control over sales, and, as if that were not enough, it has to compete against it's own sister model, the Intel based HP 6730s. 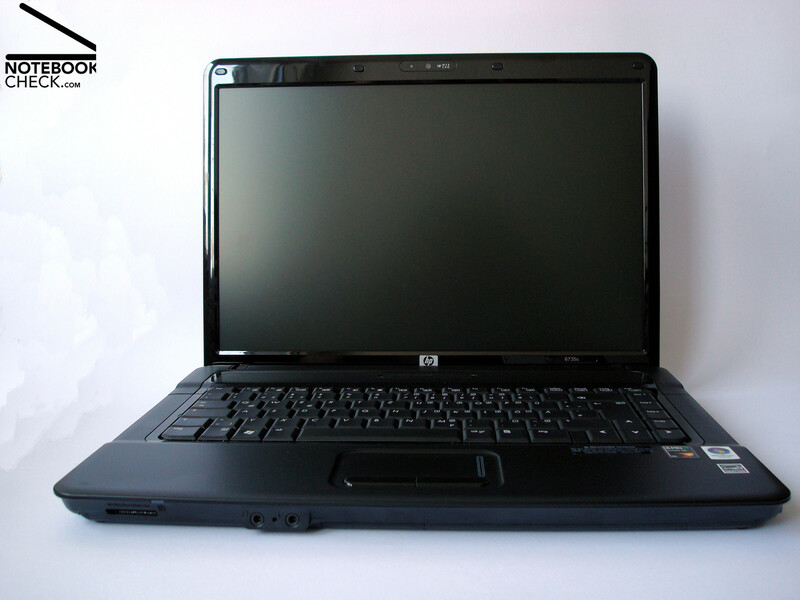 The hardware, in the laptop, makes the HP Compaq a business notebook in a 15.4" format. 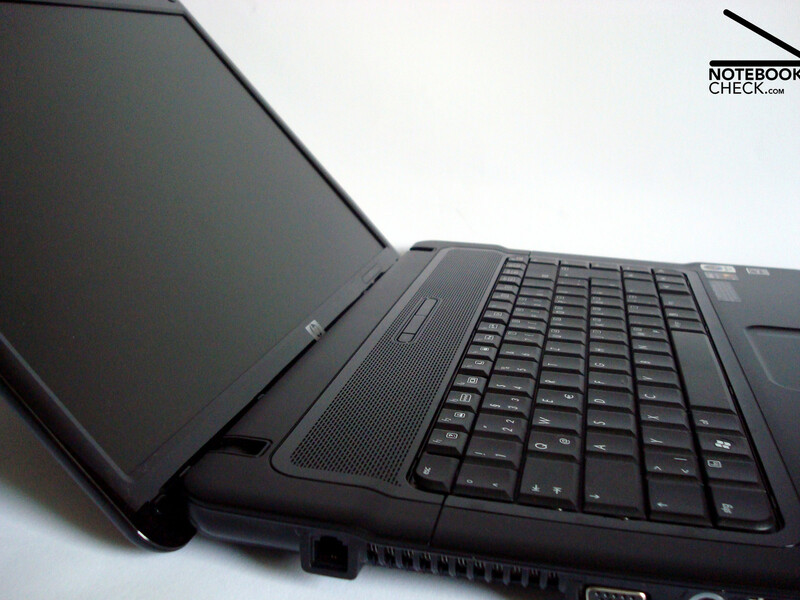 The case of the laptop complies with this notion, as it is black and semi-matt, and is made of a synthetic material. Thus, the surface of the laptop, which could be described as either conservative or lacking creativity, does not follow the general trend to make everything in sight glossy. Well not quite - The touchpad keys, a small area around the keyboard, and, for some reason, the display frame are a shiny black. Especially the display frame, which requires a lot of handling, due to the opening, adjusting and closing of the screen, is covered very quickly with unwanted fingerprints and smudges. The case is mainly made of a synthetic material which is not so easy to clean. This material can be found in the inner regions of the laptop and on the display cover. 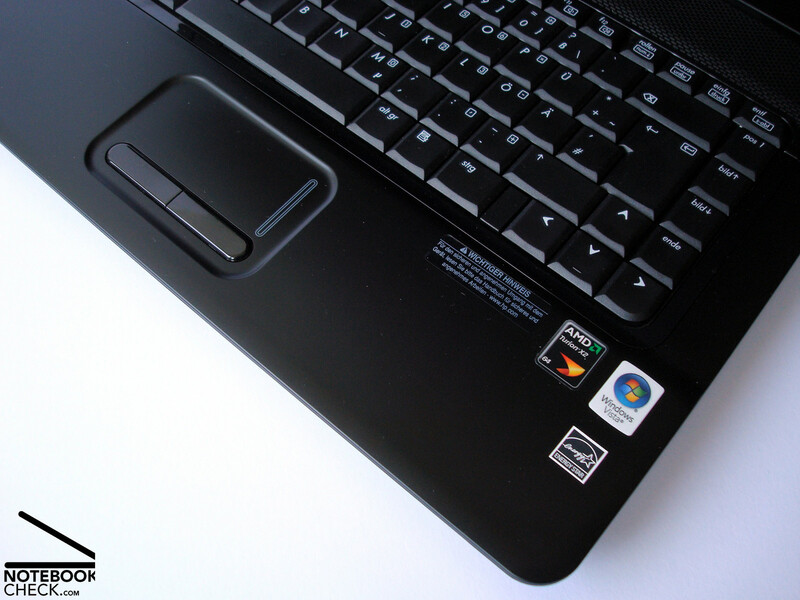 Due to the color (black) and the glossy surface of the material, the dust and smudges can be found on this surface far more often than on the rest of the laptop's rougher surface. The quality of the test model's case makes a very good first impression. In our test model we did not find any distortions or flaws which could have been caused by mistakes made during the assembly of the notebook. The palm rest, the right keyboard half, and the display cover areas can only be bent slightly, which is good. Even the 8 cell battery hugs the back of this laptop's case tightly, unlike in other laptops where the battery could be a bit loose. 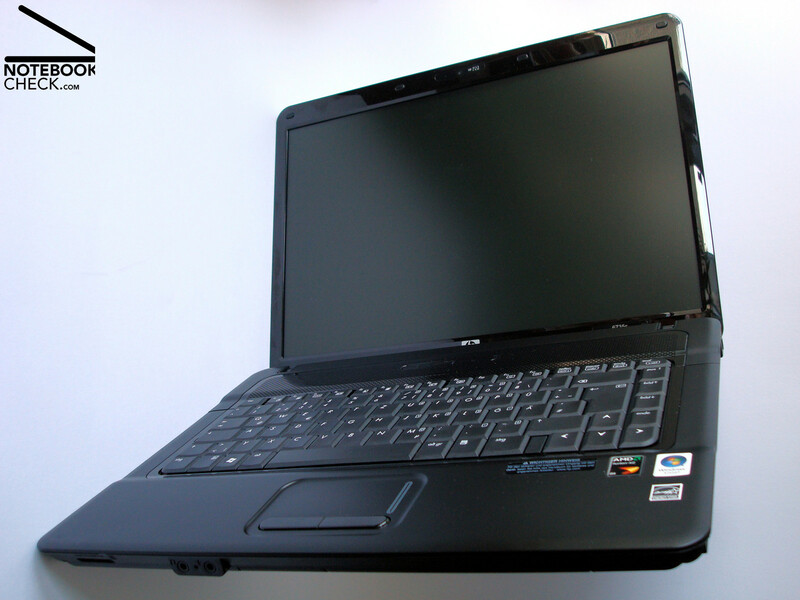 The regions above the battery, that is, at the top of the keyboard, and around the optical drive are more pliant. However, these flaws don't play any role in the practical use of the notebook. The user first notices the pliant DVD drive when, during transport of the laptop, he/she touches the laptop, as the DVD drive is near the front of the notebook. 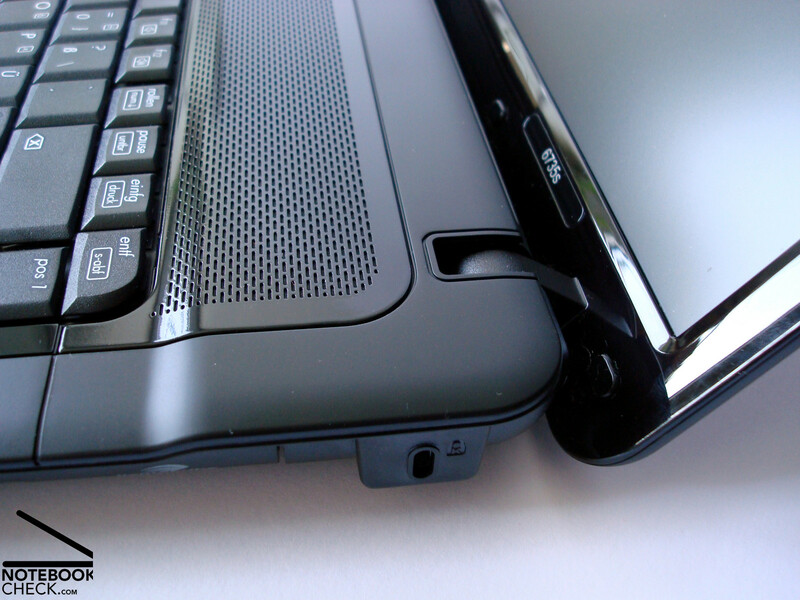 The display hinges hold the screen securely when it is open and even allow the laptop to be closed with one hand. However, opening the laptop is a completely different story. 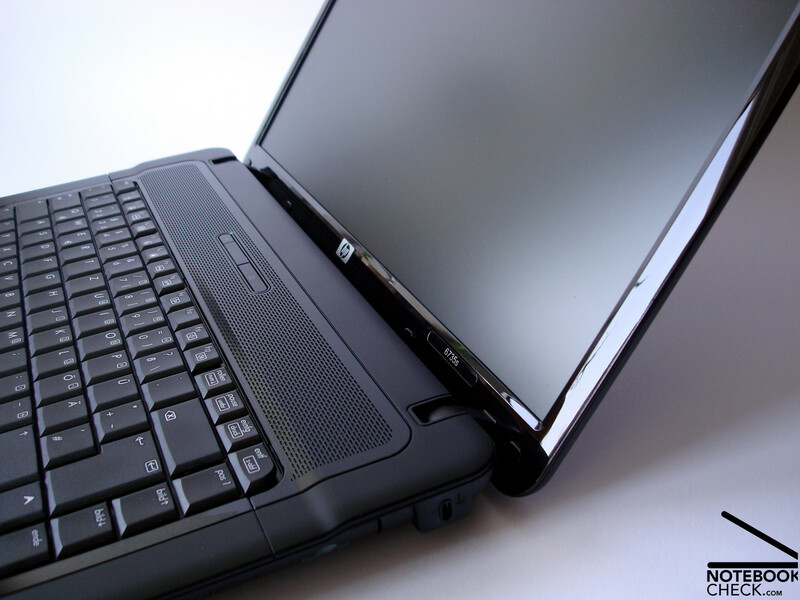 The user can not do so single-handed as, due to the weight distribution concentrated at the rear of the laptop, the user would not only pick up the display, but also the whole front of the laptop. When open, the screen can be extended to a maxium angle of 135°. This can be problematic when the laptop is being used on the lap for surfing, as the dispay would have to be extended to it's maximum viewing angle. One major disadvantage of the display is the missing locking mechanism, which holds the base of the laptop and the screen together. The hinges are supposed to fulfill that task. However, they are not able to keep the screen and the base of the laptop together when the laptop is closed, and so, during transport, these two keep constantly, but lightly, colliding against each other. Thankfully, the display has protruding rubber strips which stop it from colliding with the keyboard's keys. Still the constant movements of the screen will eventually wear out the hinges. So the user should buy a neoprene cover which is cheap and serves two purposes. It prevents the display from constantly moving while the notebook is closed, and it also ensures that that the laptop is not scratched or otherwise damaged. Without the cover there is always the chance that some object might slip into the opening between the screen and the keyboard, thus causing severe, maybe even irreparable, damage to the display. 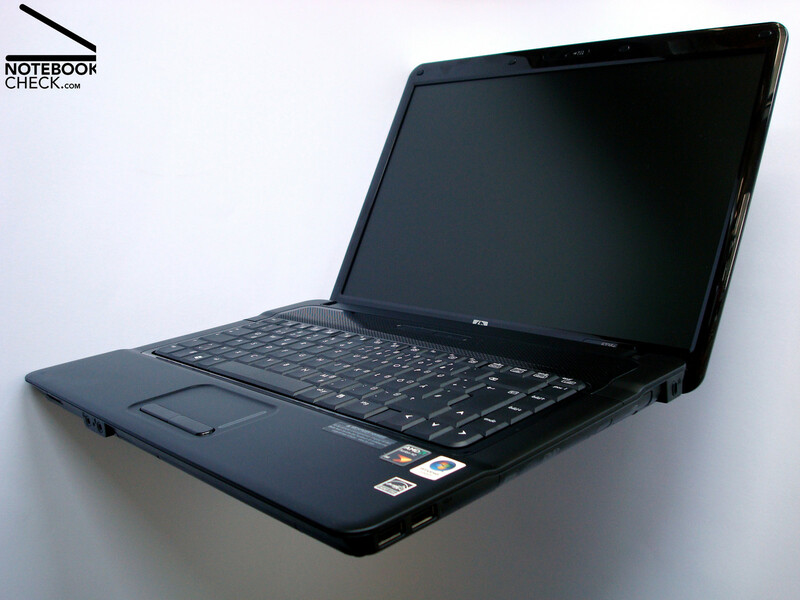 The bottom of the laptop is made of a very resistant synthetic material, which only bends under heavy pressure. 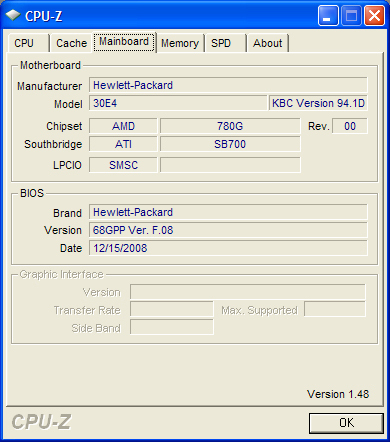 The user can also find here the covers, under which, the RAM, WLAN and hard disk are installed. After removing a few screws, the user can make modifications to the hardware, either completely replacing the unit pre-installed, or installing more components into the free slots available. The HP Compaq's weight and size are typical to it's class. Our test model weighed 2.72 kg and had the following measurements: 3.2(front) x 35.8 x 26.7 cm. If the user chooses to buy the 6 cell battery (which has a lower storage capacity) then the laptop's weight falls to 2.5 kg (manufacturer's value), which is pretty good for such a laptop. 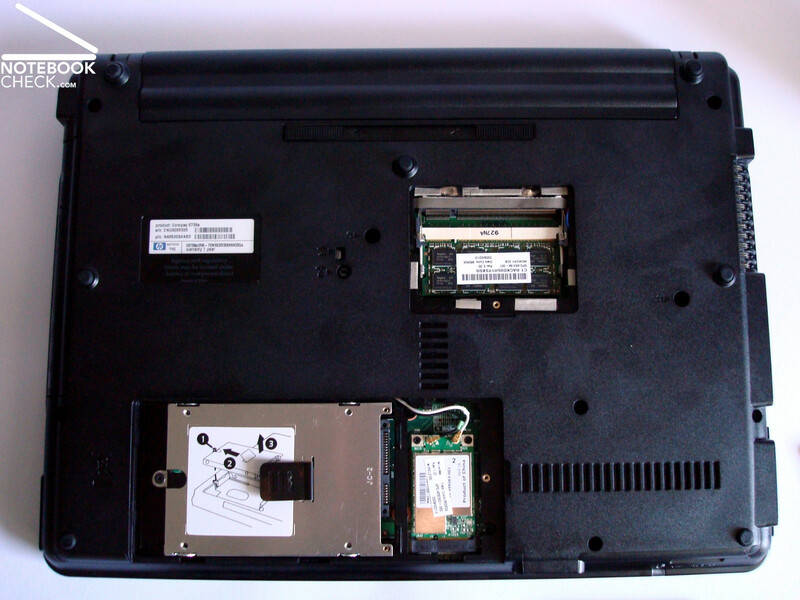 Even when the battery is removed from the laptop, the notebook is stable, as the battery in the HP Compaq 6735s, unlike those in other laptops, is not the main support of the laptop. The ports offered on the HP 6735s can be described in one word as satisfactory. Not more but not less. 4 USB ports, analogue VGA, 10/100 Ethernet, ExpressCard 54 slot, cardreader (SD, MMS/Pro, MMC, XD), audio in/out, Kensington Lock, and 56k modem are all offered on the HP Compaq 6735s. 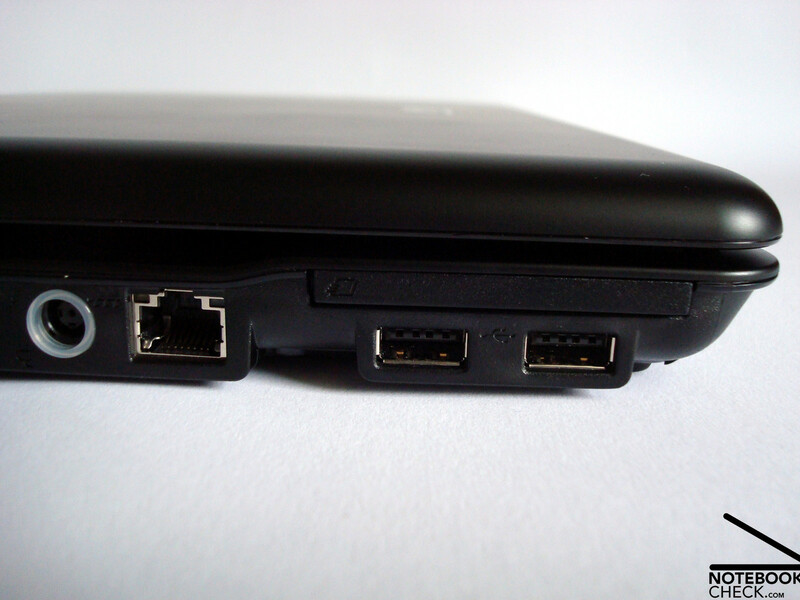 With these ports, the manufacturer fulfills any of the user's basic needs. If the user wishes to, he/she can put in additional hardware, such as, UMTS, firewire, and eSata above the ExpressCard slot. Ports such as HDMI, displayport, firewire, eSata, and so on are naturally desirable, but nobody can honestly expect to see them in this product category. One would expect a business model to have a docking port, a serial port, a travel battery, an interchangeable port, or maybe even a parallel port for companies with older peripheral devices. However, anyone expecting any of the above from the HP Compaq 6735s would be very disappointed, and would be acutely reminded of the fact that the laptop is intended for low-end users. 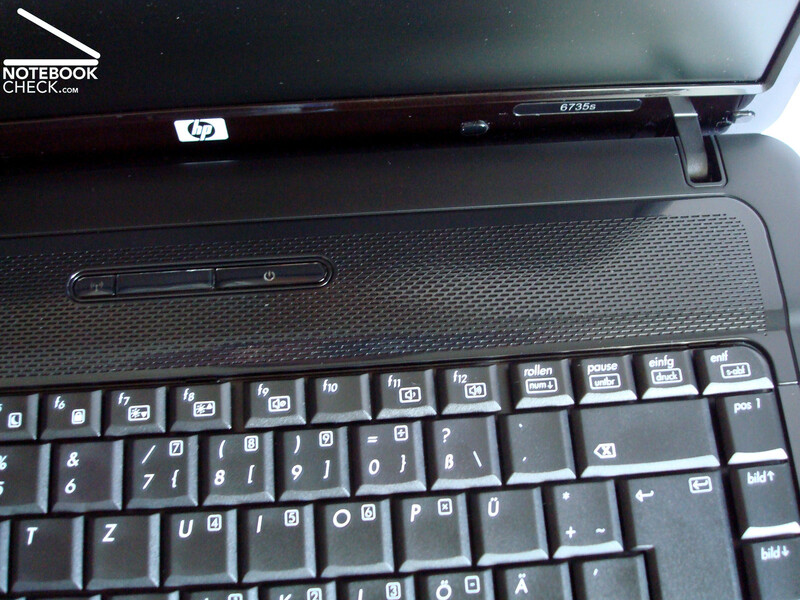 HP does, however, offer a port replicator, which connects to the notebook over a USB port, and offers DVI, VGA, 4xUSB, and 10/100 Ethernet. The positioning of the ports is also not very satisfying. For example, the rarely used modem port is very far back, and the USB ports which are used so often are placed (very close to one another) on both sides near the front of the laptop. This can be very annoying as the cables might get in the way of the work. Additionally, if the user uses the ExpressCard slot on the left side of the laptop, then the two USB ports, squeezed directly underneath it, can not be used as long as the card is in the slot. 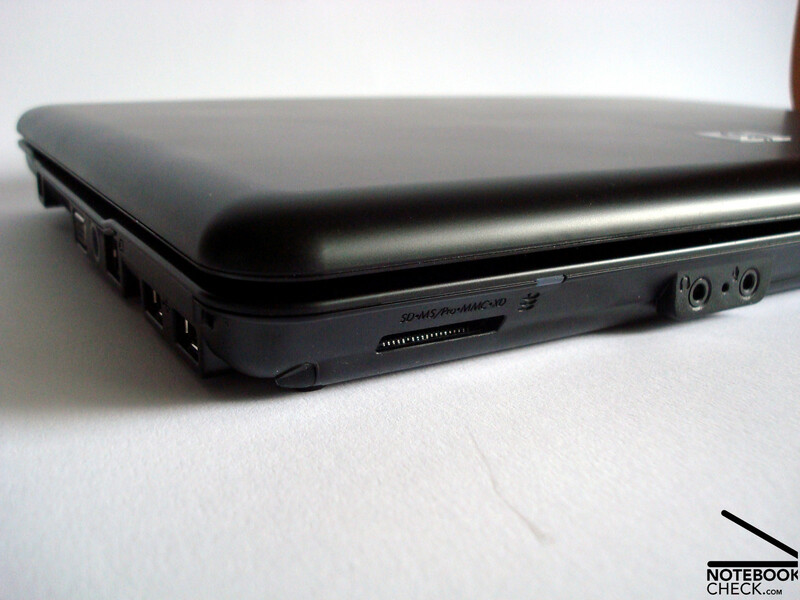 However, the choice to place the cardreader and the audio jacks near the front is good, as it is where they can be usually found on laptops. The 8 cell battery seems a bit large to us, as it takes up the whole of the back of the notebook, and thus prevents any ports from being placed at it's sides. 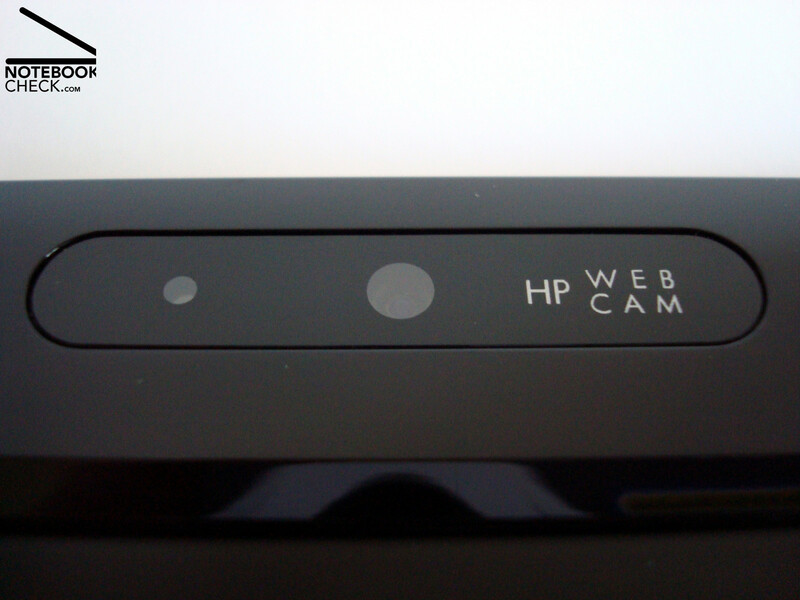 The VGA webcam integrated in the display case makes, in combination with the integrated microphone, VoIP telephoning possible, and is thus an additional advantage to users. The WLAN b/g and Bluetooth 2.0 (both are from Broadcom) take care of any wireless needs, and can be easily turned on and off from the hardware panel near the top of the keyboard. However, users will not have the fast Draft N or UMTS modules if they order this notebook in the configuration of our test model. These modules can be added to the laptop, if the user so wishes, but they will increase the total price of the netbook by a considerable amount. HP offers a guarantee of one year for the notebook and the battery, but this can be extended in many different ways. The keyboard is pleasing due to it's standard sized keys, average stroke distance, and the typical layout of the keys. The F keys, however, have a longer stroke distance and do not sound as good as the other keys when pressed. Although the above is true, the user must also take into consideration that the F keys are not used as often as the other keys, and therefore those flaws are not so important. 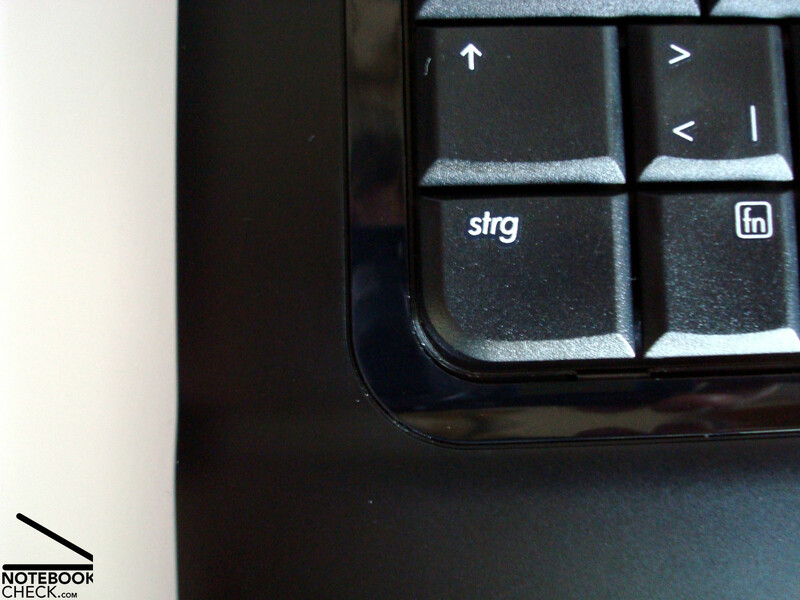 Also, the bending of the right keyboard region is only noticeable when it is under heavy pressure. 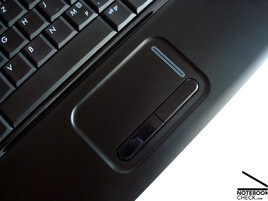 The touchpad, which has a smooth surface, is big, and it also reacts well to touch. The scrollbars along the right margin of the laptop have a great feel to them and can be used easily. The aforementioned glossy touchpad keys are easy to use and are comfortably quiet, although they do seem a bit shaky. Those users who would much rather use a mouse than the touchpad can, as Synaptics usually offers, completely switch off the touchpad and thus prevent unwanted clicking or scrolling. 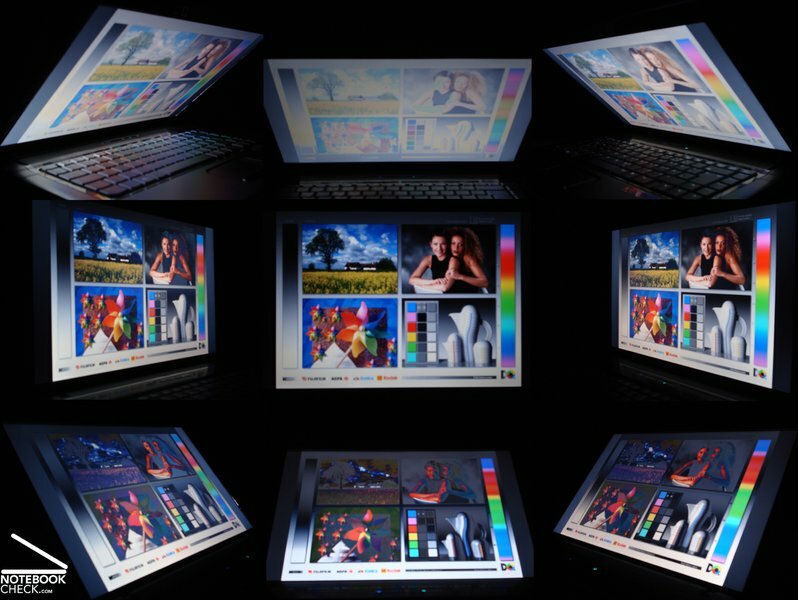 The HP6735s is available with two different displays, both of which have a WXGA resolution of 1280x800 pixels and are in the 16:10 format. Depending on the laptop's configuration, the user can either choose a "Bright-View" display with a mirroring surface, or, like in our test model, a display with a matt surface. The advantage of our configuration is that there are no distracting reflections, which makes outdoor use, and use with bad lighting easier. The matt screen in our test model (manufactured by LG/ Phillips) has good brightness values (an average of 178.5 cd/m²) and a satisfactory illumination of 78.6%. The high brightness in the center of the screen, of above 200 cd/m², is clearly visible, depending on the content the screen is showing. This brightness falls slightly near the display margins. As soon as the display is switched on, we noticed that the contrast was very weak (169:1), as can be seen by the rather greyish, and, in general, depressing colours, that appear on the screen. While this is okay when working with office, any users who like watching films or series, or editing pictures will definitely want to reconsider their decision to buy this laptop. The inefficient distribution of brightness and the weak contrast are bad enough. They are made even worse by the typically low vertical viewing point stability. In the horizontal region, most colours and contrasts remain clearly stable, but even here one can perceive early on, that moving causes the display to change drastically, depending on the angle of vision. All in all, the matt display of the HP 6735s manages to make a good impression, which should suffice for it's intended customers, that is, the business sector. Even in home office use the laptop would be sufficient. However, the user should not expect multimedia or photorealistic properties like high viewing point stability, high contrast values, or true colour. Anyone who expects those should rather look at another laptop. 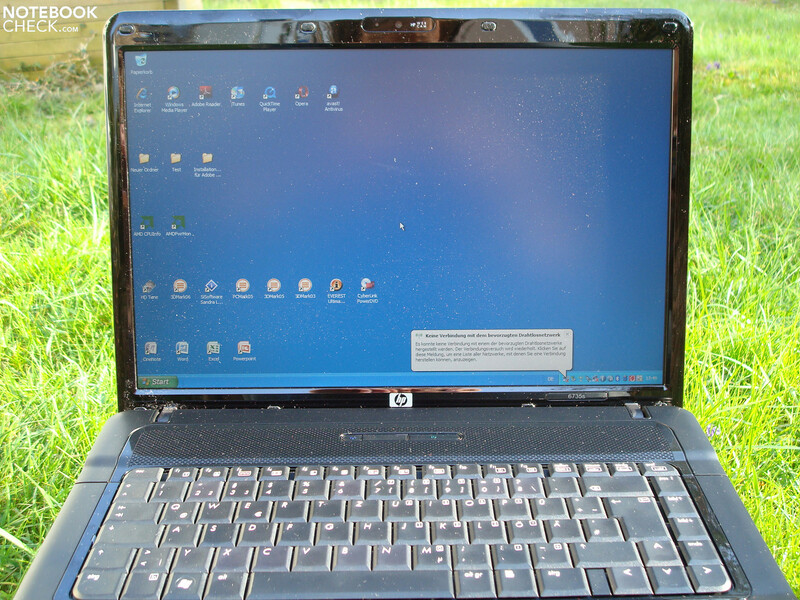 However, it is possible that the use of a glare panel, which is the alternative display offered by HP, would improve the display's performance in the above-mentioned aspects. 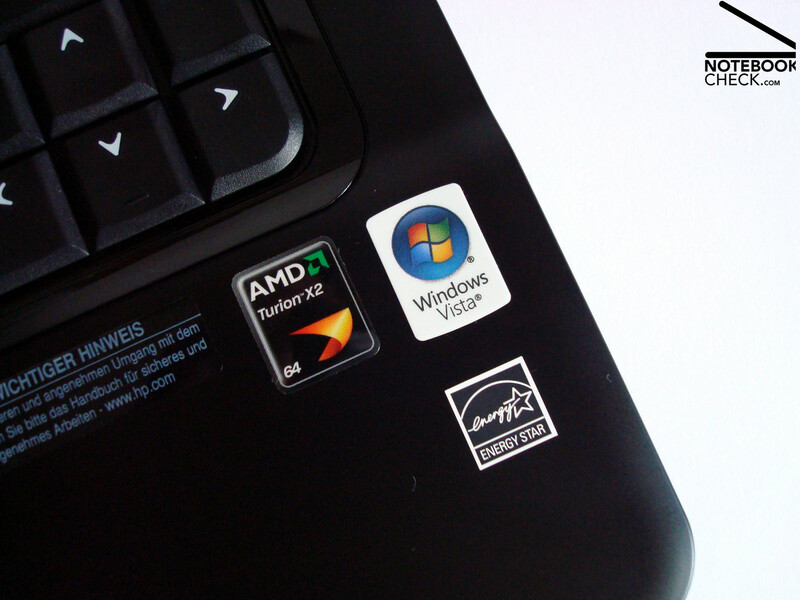 Our test model came with Windows XP Professional pre-installed, which we chose not only because it is still very popular, but also because of our test model's specifications. Additionally, to our chosen OS, we found Windows Vista Business (32 bit and 64 bit), drivers and software CDs. In total there were 7 CDs included in the carton, which for today's standards, is worthy of praise. AMD's mobile processors are not known for their high performance. The best of AMD's mobile processors is the AMD Turion X2 Ultra ZM-86 which is, in our benchmark list for mobile CPUs, still only at rank 50. 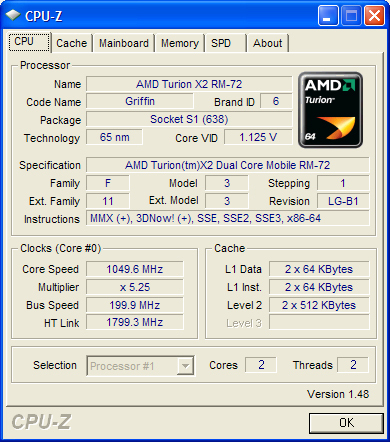 The Turion X2 RM-72 CPU (2.1 GHz/ FSB 3600 MHz/ 2x 512 kb L2 cache/ 35 W TDP), which is used in our test model, is at rank 81, pretty close to the Intel Core 2 Duo T5600. This dual-core processor promises very good performance with programs such as Office, internet, playing music, simple picture editing, and older games which are less demanding. This proclamation is further supported by the PC Mark 2005 result of 3479 points. Even small video projects and converting should be possible with the AMD system, but these will require the user to have a lot more patience than with other higher performance notebooks. The ATI HD3200 graphics chip used in the laptop belongs to one of the highest performance chips of it's kind. 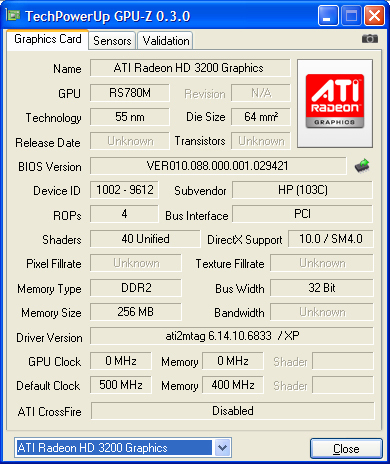 In the 3D Mark 2006, the ATI HD3200 achieved a good 1374 points. With that score, the AMD chip beat the Intel competition, the GMA 4500MHD by more than 50%. Even smaller CAD projects seem possible, as the graphics chip scores 2110 points in the OpenGL Shading of the Cinebench R10 benchmark, almost the same level as the nVIDIA Quadro NVS 140. 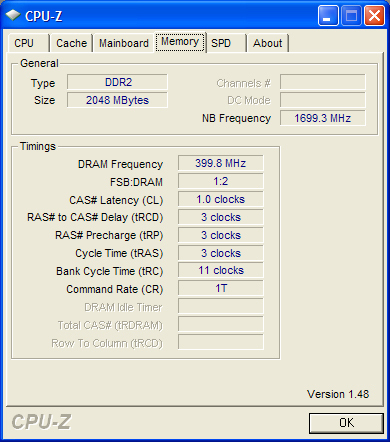 As the graphics chip does not have any storage space of it's own, it is very dependent on the RAM in the notebook. 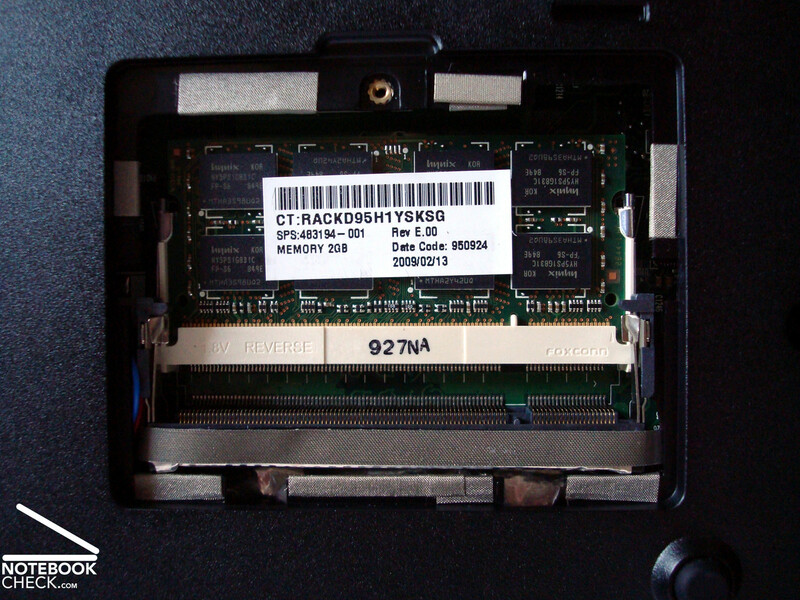 Due to this, the chip loses some points as the RAM slots in the laptop are standard 2GB slots. The second slot is empty. 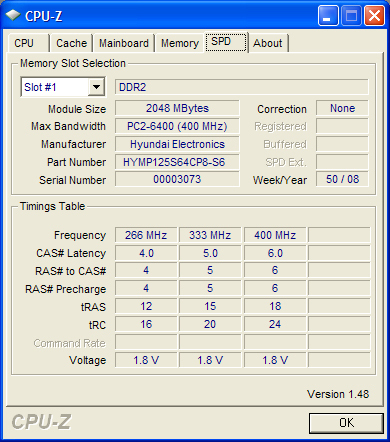 The AMD M780G chip set can support maximum of 8 GB DDR-2 RAM PC-6400 in "Dual-Channel" mode. 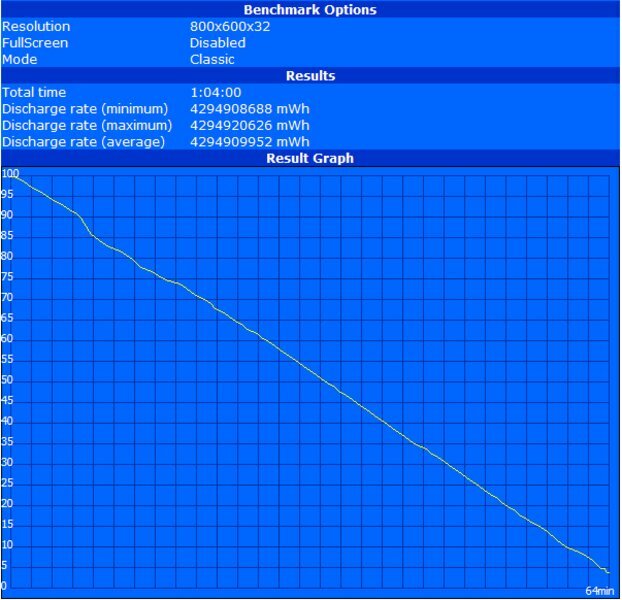 Even with another 2 GB RAM stick in the laptop, the system only reached 1561 points in the 3D Mark 2006. The HP 6735s is available with the 160, 250 or 320 GB hard disks which all run at 5400 rpm. The hard disk in our test model is the Hitachi hard disk with 250 GB. That should give enough room for storage, and the data transfer speed of 50.1 MB/s (average) is a good value. Additionally, the hard disk makes hardly any noise, and, thus, sets a high standard of comfort. 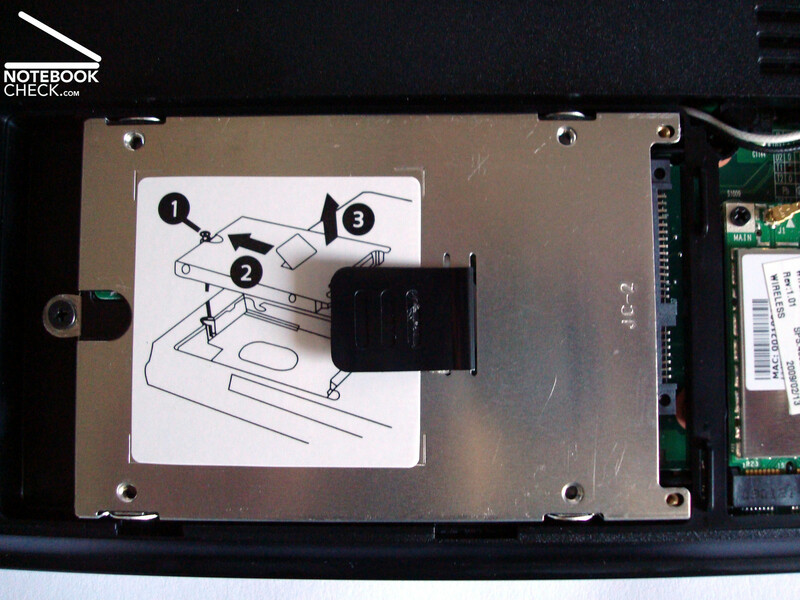 The HP Drive Guard, which is provided as an extra feature by the producer, prevents, in the case of a possible system failure, data from getting lost by stopping the read-and-write head. The optical drive from Samsung has a good response time. It may take a few seconds before the drive starts working with the CD/DVD placed in it's holder. Otherwise, the technical details are pretty much standard. One pleasing additional feature is the Lightscribe function which is a very nice way to label CDs and DVDs. Thus, HP delivers a laptop which offers balanced performance, and, due to the price, is able to compete. As soon as the laptop is switched on, the fan kicks in at full speed, which, of course, means maximum noise. This furious onslaught continues till the Windows welcome screen pops up, at which point the fan slows down. The fan runs at a quieter level of 34.2 db(A), which would sound to most people like a quiet but constant noise. When the CPU usage is low, which is usually the case when editing texts, or surfing on the internet, the fan switches itself off occasionally, only to start again in a few minutes. For this scenario, the user would have to choose the portable/laptop profile, during which the processor runs at 0.5 GHz, and a few tasks feel really sluggish. 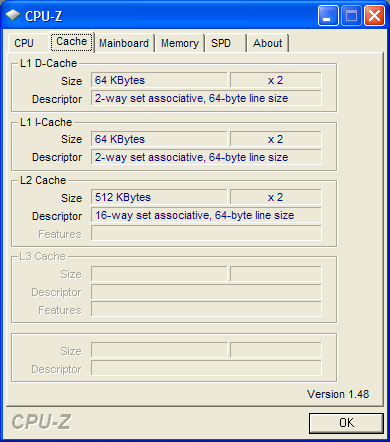 When playing a DVD, the user has to bear the somewhat louder noise emission of 37.1 dB(A), and when the CPU usage is even higher, which is the case when converting files or using 3D programs, the noise level can rise up to 46.2 dB(A) in a very short time (at this level the noise may become uncomfortable). The temperature measurements clearly show where the hottest components of the laptop are. The CPU, graphics chip, and cooling system are located on the left side of the notebook. This can be felt very clearly at the bottom of the laptop, and the ventilation slit at the left side. Although the keyboard area does not have any heat problems, the bottom left side of the laptop can get very hot (over 47°C). Maybe that is the reason why HP made sure that the bottom of the laptop had enough air flow to run the cooling system at optimal levels. (±) The average temperature for the upper side under maximal load is 34.1 °C / 93 F, compared to the average of 29.4 °C / 85 F for the devices in the class Office. (±) The maximum temperature on the upper side is 41.6 °C / 107 F, compared to the average of 33.9 °C / 93 F, ranging from 21.2 to 62.5 °C for the class Office. (±) The palmrests and touchpad can get very hot to the touch with a maximum of 37 °C / 98.6 F.
(-) The average temperature of the palmrest area of similar devices was 28.2 °C / 82.8 F (-8.8 °C / -15.8 F). 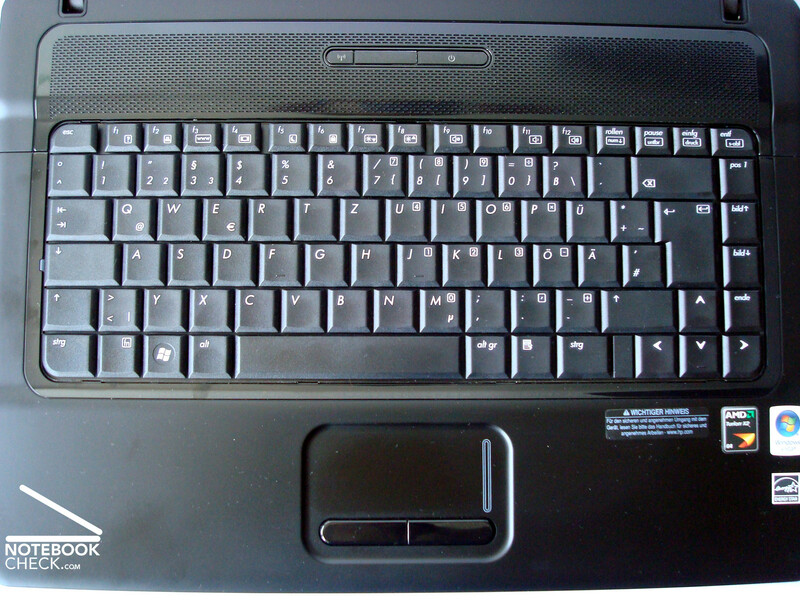 The integrated boxes above the keyboard deliver a quality of sound which is typical to notebooks. The sound quality drops as the volume is raised, which, combined with the few middle levels available and barely audible bass, is hardly a pleasant combination. However, the sound quality has almost no distortions at the maximum volume. In our test, we found that the minimum loudness of the speaker was very loud indeed. It was so loud that the testers had to mute the speakers when they were not needed. The power usage of our test model, which is based on AMD´s Puma-platform, depends heavily on the programs being used. 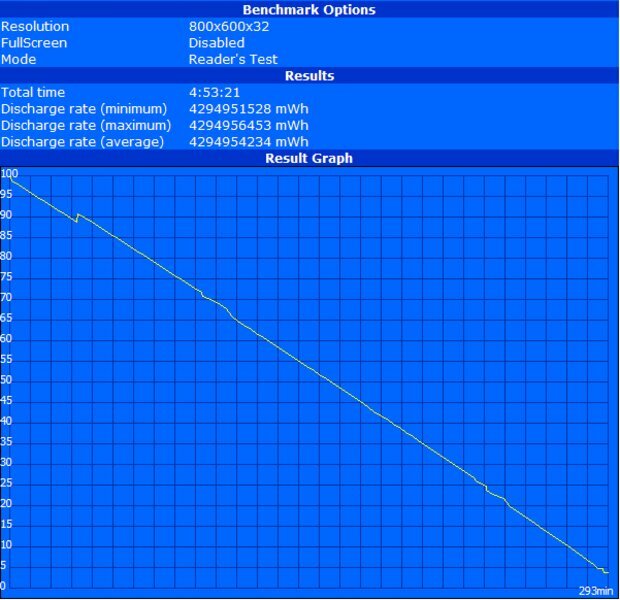 In the "Battery Eater Readers test", the laptop ran for 293 minutes (basically 5 hours). However, when the CPU was under heavy usage the laptop only ran for a pathetic 64 minutes in the "Battery Eater Classic test". Even the current consumption confirms this result (about 13.6 W when the laptop is idle and 68.8 W with heavy CPU usage). One look at the power adapter reveals that the 65 W has been specified as the power usage. Therefore, the user should not run the notebook for very long at 68.8 W if he/she wishes to avoid any damage to the laptop. When playing a DVD, the battery lasted for 2.5 hours which should suffice for most films. The battery lasted about 50 minutes longer when the laptop was used for surfing with the WLAN, which is, once again, pretty long. The 8 cell battery, which has a capacity of 63 Wh, is the reason for the long run time of our test model. As long as the CPU of the HP 6735s is not under heavy usage, the battery should be able to deliver enough energy to fulfill any of the user's needs. Those customers who want to have the longest battery life possible should pay attention to two things. 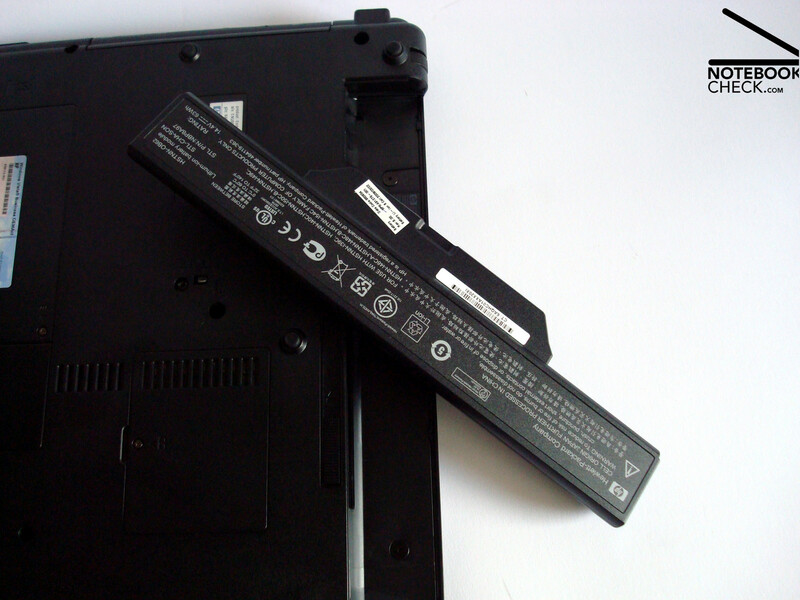 The first is the battery: Make sure that you buy the 8 cell battery with the laptop and not the 6 cell battery (47 Wh). The second is the processor. The user can change to the Turion X2 RM-70 processor which has a lower TDP value of 31 W. This value should ensure that the run time is extended by a small amount. Netbook too small, middle class too expensive? 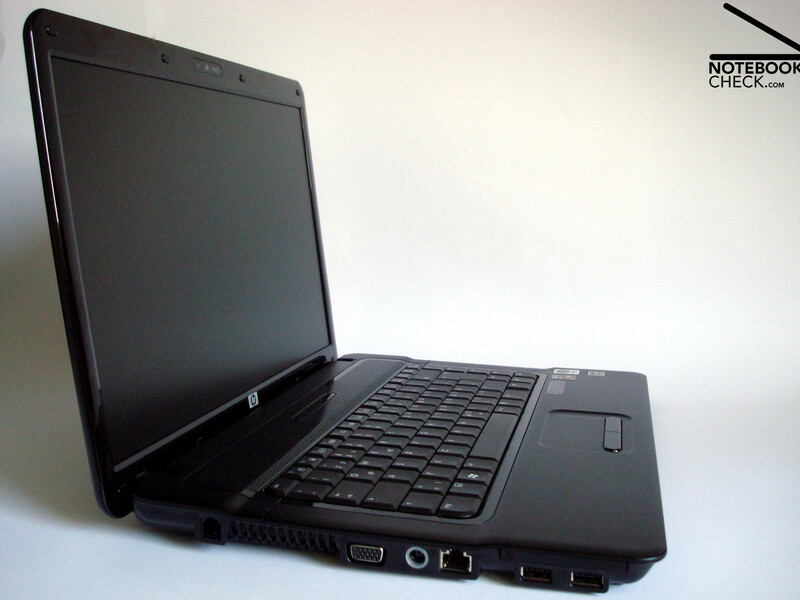 The HP Compaq 6735s offers a balanced performance with good case quality at a low price. Anyone who is looking for a cheap laptop for home office or company use will be more than pleased with the HP Compaq 6735s in the configuration of our test model, or in any of the various other configurations. This notebook is especially good due to the matt display, the long battery life, and the good connectivity. But please don't overwork the CPU! Under heavy CPU usage, the HP 6735s starts showing clear weaknesses. The battery life falls rapidly, the noise emissions rise to an uncomfortable level, the bottom left side of the laptop becomes very hot, and the power adapter starts having terrible problems. So anybody, who wishes to get maximum performance out of this notebook, should be clear about the disadvantages before he/she buys the laptop. The price, however, is despite the flaws tempting. The HP Compaq 6735s is one of the cheapest 15.4" Notebooks. The 63 Wh 8 cell battery takes up the whole of the back of the case, only leaving room for the display hinges. The 250 GB Hitachi hard drive. The hard disk, the WLAN, and the RAM(from the left bottom corner to the top right corner). 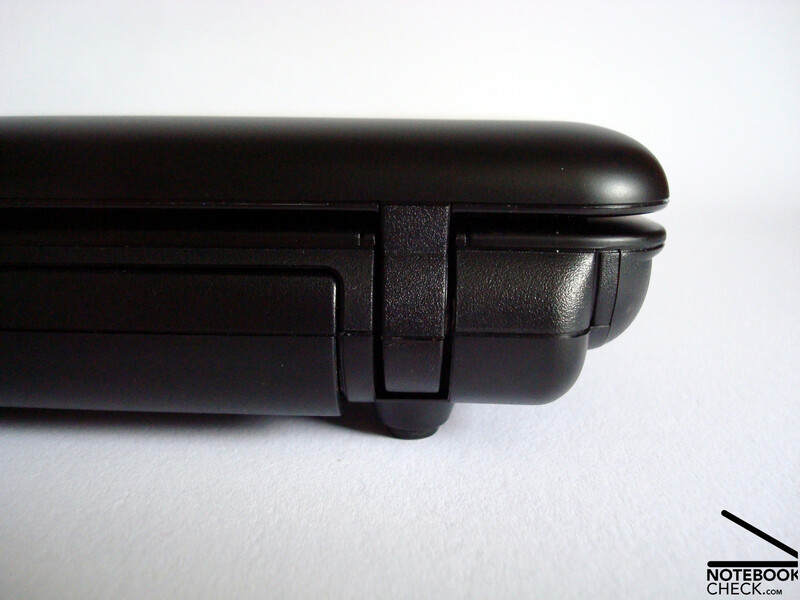 A picture of the rear of the case with the display hinges and battery. 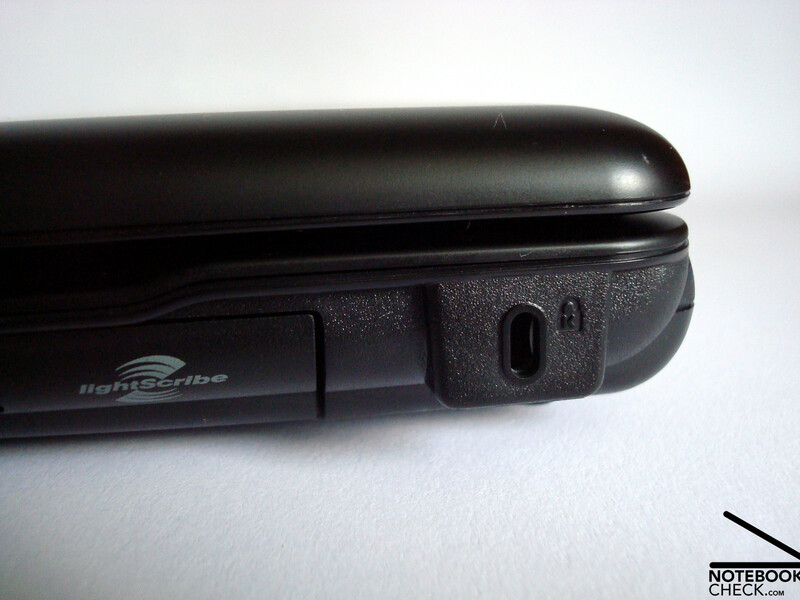 The USB ports have been positioned so close to one another, that, if the user uses the ExpressCard slot, then he/she can not use the USB slots. The "Kensington Lock" is located near the Lightscribe optical drive. The VGA webcam is integrated in the case. It does not always have to be Intel and nVidia. 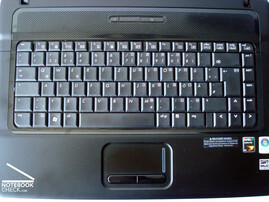 The glossy edges around the keyboard improve the look of the laptop. The loud speakers are hidden under the holes. The display hinges of the laptop are good, but they are unable to fulfill their second task, which is to replace the display locking mechanism. The matt display, with it's passable values, is ideal to work with. Unfortunately, the smooth and resistant surface of the laptop is hard to clean. 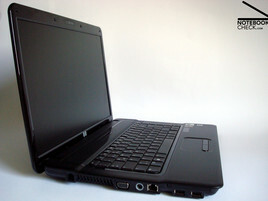 The case is identical to the case of the HP Compaq 6730s, the Intel based version of this laptop. Despite the low price, the robust case is of good quality. Cardreader (SD, MMS/Pro, MMC, XD) und audio. Very good price-performance ratio which shows that not everything has to be from Intel. A consistent cooler fan, a locking mechanism for the display and better contrast values. That there were still manufacturers who provided additional material instead of just relying on the Recovery-Partition like most other manufacturers.